I have been MIA the past few weeks, because as soon as I finished my online CTE course, I had to start gearing up for the three presentations I gave last week. I didn’t get any of my own school work done, so I’m going to have to work very hard in my classroom tomorrow! I decided to use today to get caught up on some of my creative projects. 8/9-15 ~ As I really want to take the Telling Stories Deeply class at BPS, I need to complete my unfinished classes before I enroll for another class. So, I’m going to work on my 52 Card Pick Up class this week. My goal is 2 cards per day starting on Monday. 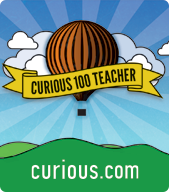 I didn’t look at my 52 Card Pick Up class once, but I did sign up for Telling Stories Deeply. I have done nothing with that class since I have been so busy these past couple of weeks. I need to add it to my challenge list for this week. 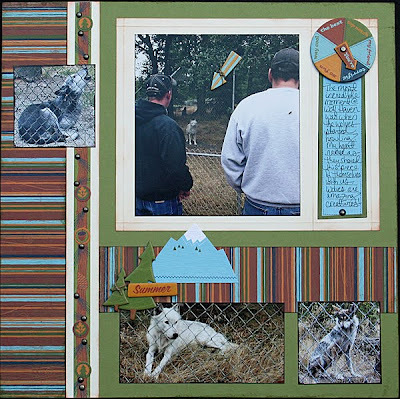 Blog ~ Post my LOs from Kyle’s visit and my two cards each day. Blog “The Great Escape” story! I did post the LOs from Kyle’s visit, but I still need to work on “The Great Escape” story. Hmm…I’m sensing an opportunity to double dip with my Telling Stories Deeply class! 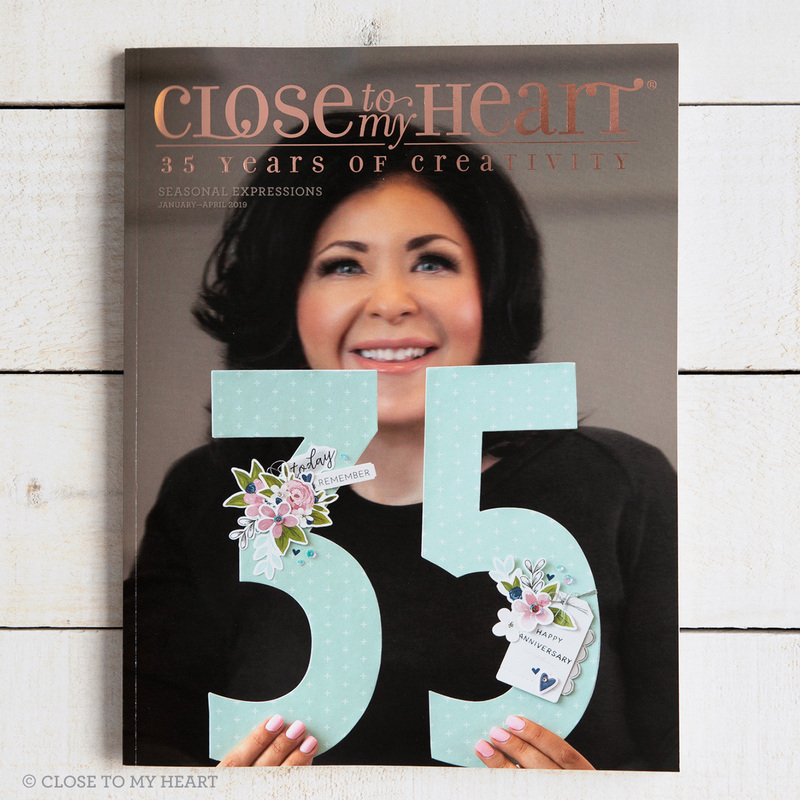 CTMH ~ Advertise and prepare for my Christmas card workshop; finish my Leadership projects; complete my card swaps. Yikes! It’s a good thing I’m still on summer vacation. I finished my card swaps and Christmas card workshop. I still need to finish the Leadership projects. I fought tears most of the way home from Safeway this afternoon, but soon the emotion overwhelmed me and bitter tears poured down my face. Neal asked me what was wrong, and it took me some time to compose myself. What was wrong? What was at the core of this despair? I hadn’t noticed the signs or balloons on our way to the store. It wasn’t until we were leaving the parking lot that I noticed the makeshift memorial where we usually saw an older man sitting on an upturned bucket. The bucket was there, but the man was not. In his place stood a sign that read, “His name was James.” Bouquets of flowers were taped to the stop sign. I blurted out, “Oh, that man died.” That man died. James. I didn’t know him. In fact, if truth be told, I never bothered thinking about him more than the moment we drove by him as we left Safeway each week. I do remember some specific moments such as the time his plumbers crack was showing. We laughed about it. I remember a couple times I was alone and I wondered if I had any granola bars or bottled water to give him. I never stopped. I certainly never stopped to ask his name or learn his story. I would drive on by and he would slip from my memory, but not today. Not today! Today I am consumed with the fact that I never once wondered about him other than why he was begging. Today I am wondering how I have become so judgmental and uncaring. Am I not an accident or debilitating illness away from needing a helping hand? What happened to the me that used to care so much about people that my heart broke when I saw someone begging by the side of the road? And there’s my answer. My heart broke. My heart broke, and instead of allowing it to mend whole and fragile, I forced it to harden. Luckily, I’m not so bad that I’m hard hearted, but I certainly am not the me that used to volunteer at Camp Easter Seal or for the nursing home. I think I became so tired of being hurt and feeling pain, I simply stopped putting myself in situations that would break my heart. When I was explaining all this to Neal, I was reminded of Julie’s article in the T-Bird Splat (my school newsletter). She wrote about a revelation she had during a 4Ps presentation. She became painfully aware that this boy sat through her class the previous year, and she never really knew the struggles he was facing on a daily basis. Her advice to us is that “kids won’t care how much we know until they know how much we care.” It sounds so cliché, but the truth of her words slapped me in the face. Passion has been missing in my life for quite some time. I’ve felt moments of depression, and I really couldn’t figure out why. I’m more fit and healthy than I have been since college. I teach at a great school and have incredible friends. I get to scrapbook during my free time and share my love of the art with others by leading workshops. I’m married to my best friend and have an amazing marriage! So, why do I feel empty? I think James gave me my answer today. I have not been feeding my soul for a very long time. I allowed a wall to keep me from being hurt, but it caused more damage than I could have imagined. I’m a scapbooker and an English teacher. I love stories! Not simply my own stories, but the stories of those around me. I want to know what makes people tick, and how someone like James ended up on the corner of the Safeway parking lot. I need to feed my soul by helping others. For years, I have used the excuse that I’m a teacher; that’s my volunteer time, but I know I can do better than that. Plus, if that is going to count as volunteer time, then I better do far more for my students than I have been over the past couple of years! Now, I will say that the closest I have come in a long time to feeling like I was making a difference was this time last year. It was right after the Close To My Heart convention in Florida. Jeanette Lynton gave a moving speech as she introduced William and Kathleen Magee, the co-founders of Operation Smile. She explained that she was so touched by the work that Operation Smile is doing for children around the world that OS is becoming CTMH’s exclusive charity. Shortly after convention, we were able to offer the From Me To You card kits for a $10 donation to Operation Smile; I was able to raise over $130! I was only $110 away from providing an operation for a child. It only costs $240, takes 45 minutes, and changes their lives forever! Unfortunately, I wasn’t able to earn the other $110, but I’m done focusing on my failings in the past and am going to look to the future. So, what is my why? I want to bring smiles to the faces of those I meet and allow their joy to make me smile! As a teacher, I will do this by showing my students that I truly care. I want to know their stories and help them succeed in the classroom and beyond. As a friend, I will do this by staying in better contact with the people I love. I make tons of cards as a scrapbooker…I’m going to start sending them! As a wife, I will remind Neal daily of the difference he makes in my life. He is my everything, and I am not going to let him forget it. 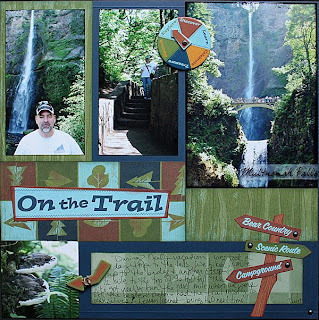 As a CTMH consultant, I will teach workshops and help my customers gain confidence in creating beautiful art to chronicle their memories. I will work to raise money for Operation Smile so that I can put a smile on the face of a child who may have only known pain and misery. I will live my life with passion, because I am beyond blessed! I will remember that his name was James, and I will smile! You guys know how much I love CTMH products; I think it is safe to say that I’m addicted…LOL! What I love the most is how versatile they are; in fact, this is the key point they make on the latest episode of CTMH TV. 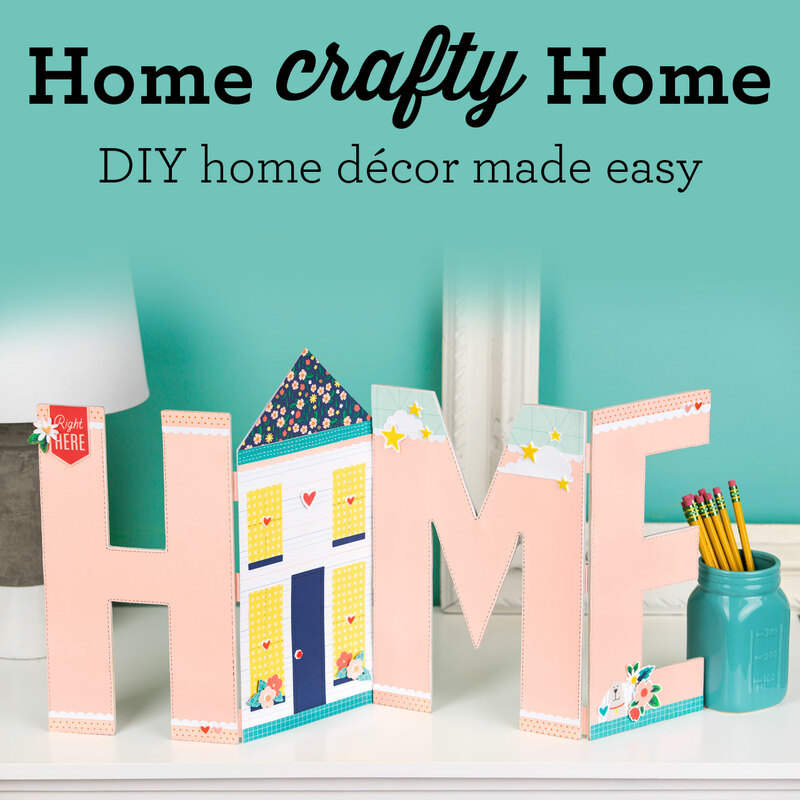 Take a look at these new Grace papers; they are perfect for feminine or masculine projects. The text paper is well suited to Thanksgiving or any other project that expresses thankfulness for family, but what about Halloween? 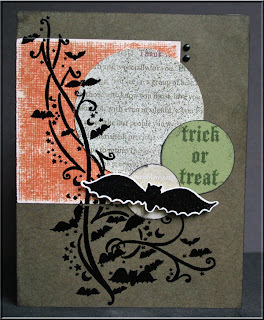 Well, I say “Yes!” This is a card that I made for a swap using the new Grace papers and Beware stamp set. I used the front side of the text paper for the large circle and the back side for the smallest circle. I speckled the large circle with Black and Olive markers using an airbrush and then added Black Distressing Ink to the other circles using the Black Texture Tool. 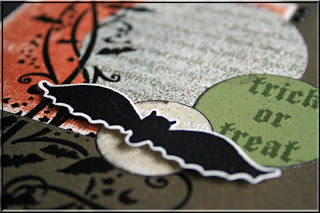 Using these distressing techniques helped me convert a shabby chic Thanksgiving kit into a spooky Halloween card! Digital LO vs Studio J! 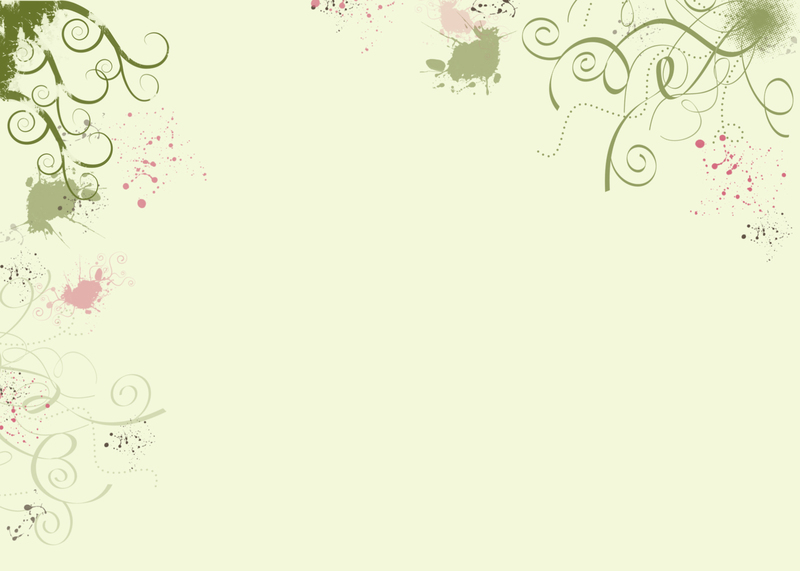 Well, I received an email from scrapNfonts this morning with some freebies and a challenge. I’m not typically a digital scrapbooker, but I took up the challenge since they included a free Photoshop template. I can’t remember how long it took me to complete this LO, but I’m fairly sure it was close to two hours! It’s cute, and I will print it for one of my albums, but it got me thinking about how excited I am for Close To My Heart’s Studio J! 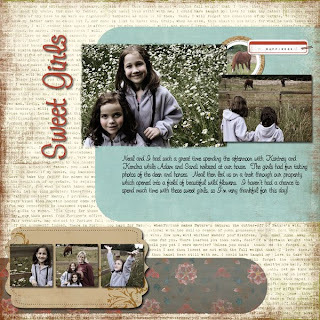 Studio J takes digital scrapbooking to the next level by providing you with an online scrapbooking studio FREE of charge! 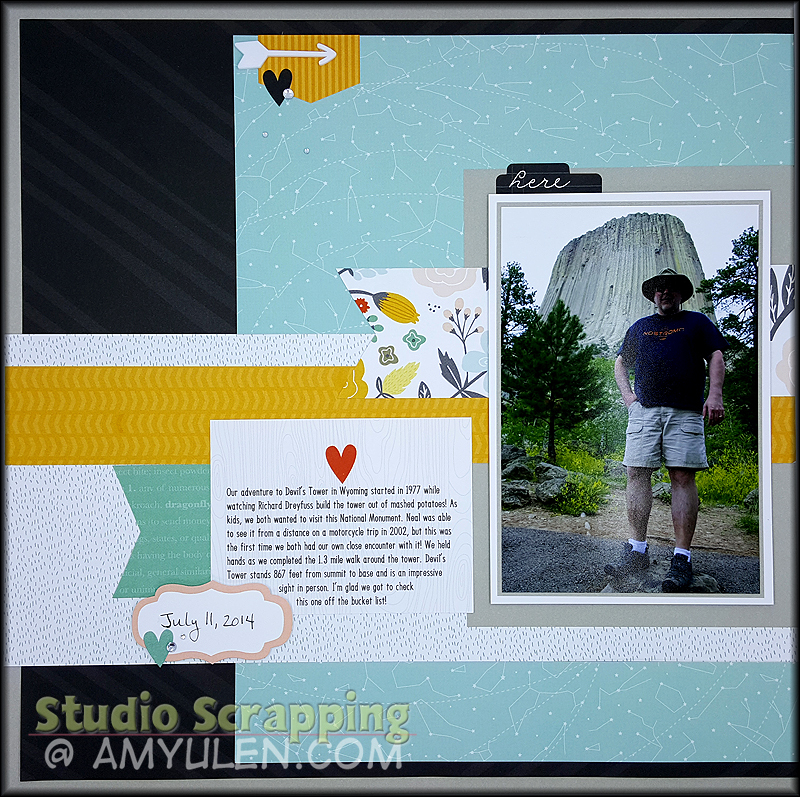 The best part about studio scrapbooking is that you don’t have to know anything about digital scrapbooking to QUICKLY…notice I said QUICKLY (unlike my LO here! 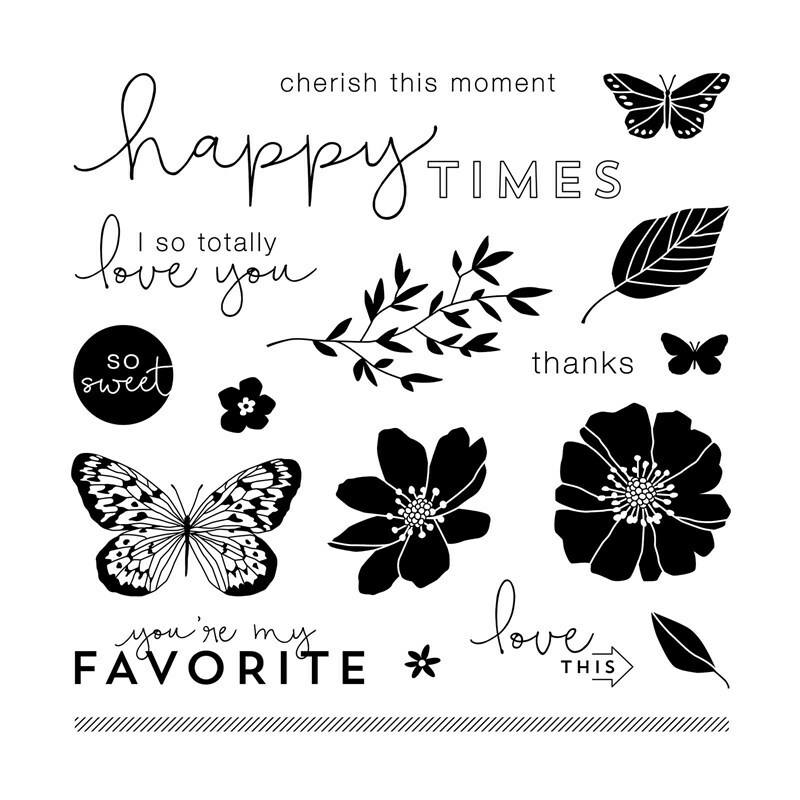 )…create beautiful pages using CTMH patterns, papers, embellishments, and colors! I saw a demo of Studio J at Leadership a couple weeks ago, and I’m so excited about trying it. Visit the Studio J website and watch the video to see a quick preview. Then come back here and let me know what you think! I thought I was being kind by letting the boys sleep in, but it ended up being a bad move. By the time we got up to the mountain, the parking lot was full. I couldn’t believe how packed it was during the middle of the week; I would hate to see what it is like there on the weekend. Anyway, we ended up parking a couple miles down the road and hiking back up to the visitor station. We only had a couple hours to spend on the mountain since I needed to get home for the mobile vet visit. We ate a quick lunch and then walked the Skyline Trail to Myrtle Falls and down the 4th Crossing Trail right to our car; it was almost like we planned it that way! It was a really easy, relaxing walk. I’m looking forward to going back and trying some of the more challenging trails. 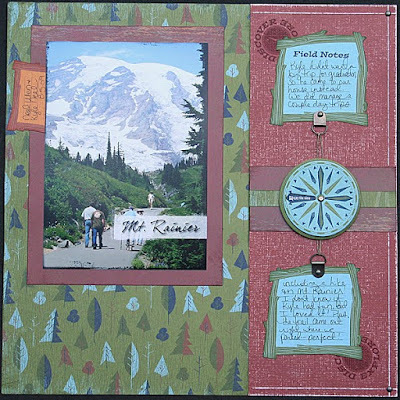 All supplies are CTMH: Bella WOTG sketch, Back Country, Campin’ Fever, pewter brads and photo hangers, Adventure Dimensional Elements, natural hemp,sanding kit, and My Legacy Writers. I absolutely love this Back Country kit! I added Barn Red textured cardstock and I’m now wishing I would have used a different color. I had already sanded it, so I wasn’t going to start over. The Bella sketch has the title under the photo, but I placed the title on the photo, so I’m wondering if I need anything under the picture. Don’t get me started about that picture! I used a great grunge mask from the jessicasprague.com Photoshop class. After I uploaded the photo to Wal-Mart, I checked their print preview option and it looked just like it does here. Well, when I picked up my photos yesterday, most of the top and left borders have been cut off. It looks hideous now, so I adhered it with removable adhesive and am going to print it out at Costco this week. Ugh! This is a Graduation Trip? When Katie graduated from high school, I took her to Disneyland. We had a wonderful time, and I knew that I would do the same for Kyle when he graduated. Well, fast forward six years to Kyle’s graduation…he doesn’t want to go to Disneyland! Not want to go to Disneyland? I couldn’t believe it. So, I tried to think of other fun trips we could take that he would enjoy. Perhaps to a Dude Ranch or the Nascar driving school. Nothing appealed to him. He even admits that he doesn’t like to try new things even though he knows that he will probably end up liking it in the end (our Disney cruise last summer taught him that). Alas, we ended up giving him money for graduation and decided he would visit us for a few days this summer. I knew I would be in California for the CTMH Leadership conference near my sister’s birthday, so I called Kyle to see if he wanted to come up the following week. Since he did, I flew from LA to Boise to spend the day with my sister and then Kyle drove me home. The nine hour road trip provided us with more opportunity to chat about life than had we gone on a big vacation, so this really worked out in the end. We did end up taking a couple day trips to Mt. 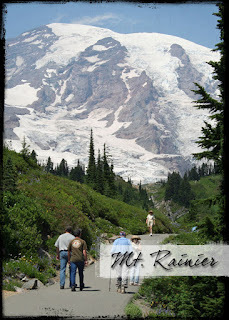 Rainier and Wolf Haven, and I had a great time scrapbooking those events today. 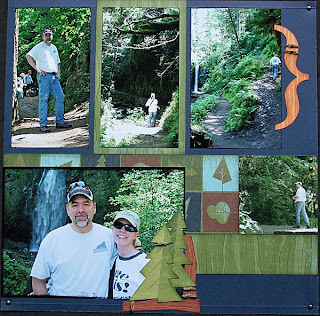 To celebrate his 2nd week of vacation, Neal and I took a day trip to Multnomah Falls on Monday. Our other option was going to the ocean, but we decided it would be more fun if we could spend the night, so we did something a little closer to home. I don’t think either of us planned on hiking as much as we did, because we did not come prepared with good hiking shoes and were wearing jeans. It was incredibly hot, and I was longing for some khakis! Luckily, we ate lunch at the Lodge before heading up so the lack of trail food wasn’t that bad, but the lack of water about killed us! We probably should have turned around once we got to the top of the waterfall, but we pressed on. It was so beautiful and the next mile was so peaceful since very few people went off the beaten path. As rugged as some of the non-paved trail was, it was absolutely worth it to truly enjoy nature alone with my husband! A little over two miles up the mountain, we ran into a work party repairing part of the path that had been washed away. They would have let us by, but Neal and I are both glad that we turned around. We were both feeling dehydrated and needed to get some water. Unfortunately, Neal was far worse off than I was and developed an incredible headache on the way home. I slept most of the way home, so I felt fine! What surprised me about the trip down the mountain was that it hurt more than going up; my feet were killing me! Neal had me tighten my shoelaces and that made a big difference. Honestly, my feet were the only things that hurt on the trip. My legs weren’t sore at all during the hike or the next day. Yet, my hips were so sore the next day; I couldn’t believe it! I’m only 42 and they made me feel like I was 80…this is not a good sign for my old age. 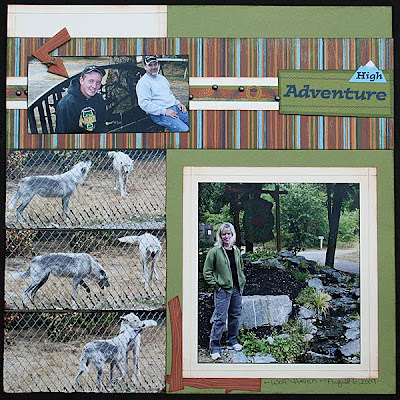 This LO is a direct scraplift from page 19 of the Summer 2009 Idea Book. 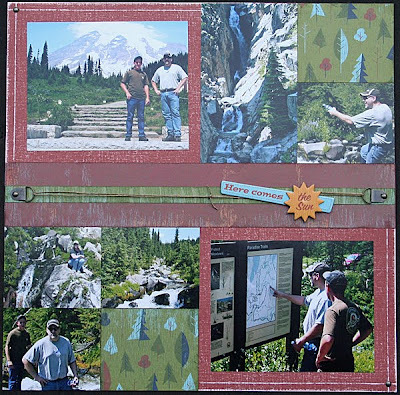 I absolutely love this Back Country paper packet and need to find my other outdoor/camping photos to finish off the packet. 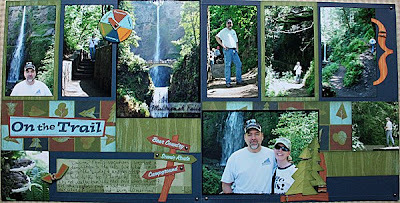 It’s hard to see, but I added grunge masks on the 5×7 photos and an overlay on one with text that reads, Multnomah Falls. I’m practicing my Photoshop skills! I had a huge “To Do” list today, but I spent it working on my Shakespeare High Cafeteria instead. I wonder about myself sometimes! To top it off, I added a Shakespeare High Twitter, because I obviously need to spend more time on the Internet! 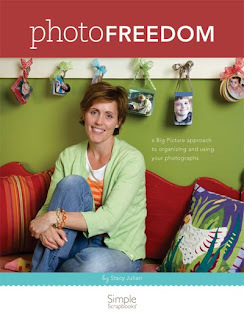 As per the world of scrapbooking, my copy of Photo Freedom arrived today…woo hoo! 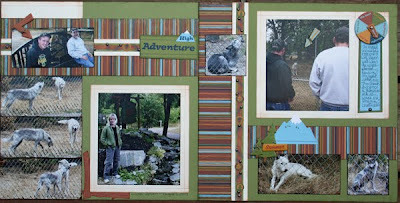 I need to get ready for a card workshop tonight, but I should be back to scrapbooking tomorrow night. Neal and I took a hike up Multnomah Falls yesterday and I can’t wait to scrapbook the experience! I won’t look at the photos until I finish prepping for the workshop or I’ll be up all night. I have issues!